thegameshak-usa has no other items for sale. The historically themed city-building made popular in Impressions games such as Caesar III and Zeus: Master of Olympus moves from the Mediterranean to the Far East with this release set in ancient China. Emperor: Rise of the Middle Kingdom takes players behind the Great Wall to nurture a metropolis that will stand the tests of time. This release was developed by BreakAway Games, the studio that created the Cleopatra: Queen of the Nile expansion for Pharaoh. As in earlier Sierra releases under the Impressions label, this building game is infused with history and culture. Players begin under the Xia reign of 2100 B.C., then progress three thousand years through the Shang, Zhou, Qin, Han, Sui/Tang, and Song dynasties. Cultures develop along the four ancient philosophies of ancestor worship, Confucianism, Daoism, and Buddhism. City improvements produce appropriate commodities such as rice, silk, tea, jade, and many others. Players have new options in manipulating trade and commodity prices, under a system designed to allow participation in trade wars. The game also features elements of martial defense and combat as well, with realistic wartime hazards such as siege engines, collateral damage, and flammable structures. Like the earlier games though, the focus is on developing a complete, balanced infrastructure for an ancient Chinese capital that will endure any challenge that history holds. Emperor: Rise of the Middle Kingdom is built on a new graphics engine for greater visual detail in all areas of gameplay. Multiplayer games feature spies and diplomacy, and players can raise armies and send them to invade a rival or assist and ally. Allied players can also work together to complete great wonders of engineering, such as the Great Wall and the Grand Canal. I would say that this game is on a par with Sierra's other city building games-Caesar III, Pharoah, Cleopatra, Zeus, and Poseidon-but with one new feature: you can play it online with your friends. If not for that feature, I probably would've only given this game 4 stars. The graphics are pretty cool. The icons all look the same to me. The warehouse icon looks like a trading post icon that looks like a mill icon, etc. I suppose I'll get used to it. I remember not liking that about Zeus at first either, but that one eventually became my favorite. The other interesting thing about this game is that feng shui is very important to your people. In the other games, if you could place a building in a certain spot you got a green footprint, if you couldn't, you got a red footprint. In this game you get red, green, and YELLOW footprints. If you get a yellow footprint over the spot you want to place a building on, you can still put it there if you want, but it decreases your feng shui rating. And the less harmonious your feng shui, the less your people like you. So you really have to think a lot when you're building your city. I'm not sure that this game is Sierra's best city building game, but it's still fun to play and I would recommend buying it. I would also recommend getting Acropolis, which is Zeus and it's expansion pack Poseidon in the same package. My old version cracked after about 10 years. Even after all that time the game still holds up and is very engrossing. Expect to spend hours playing. If you already had a copy, this one will work with your current save files and no extra downloads will be needed. 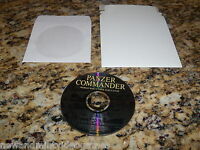 Its a perfect copy of the first release. The absolute best game for PC with a true city building experience! If you want a TRUE city building experience, THIS IS IT! You have to maintain a city, make your own food, mine your metals, and create your basic necessities! If you don't, your people will leave! I've never liked the way "Civilization" looked when it was played, and the graphics on this are TOTALLY different! You SEE the people move about, you control where they can walk, how many open businesses you have and when/how much you trade with other cities. You can also conquer other cities as well as make treaties with them! And don't forget the gods! If you do, they WILL cause destruction!! Educational, historic fun. Play Emperor! This game, with it's many skill levels of plays provides hours of fun for any player. Along with recreation, you learn about the rise of the Chinese civilization. It also gives valuable lessons in state craft and community management. The graphics aren't the best but the game is a few years old. Long term play can get a little repititious but anyone will get their money's worth on this one. 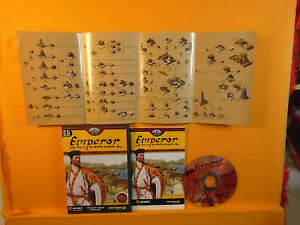 There are very few games on the computer which captured my attention as much as the original demo version of Emperor that I recieved via PC Gamer Magazine. Of course once I actually wanted to buy the game I wasn't able to find and so I looked to ebay to get it. The game in essence is that of a strategy city-building game. You are put in the position of leader of a ancient Chinese city and must grow the wealth and influence over time. Overall it is a good game with high replayability. It includes some micro-management which may bore some but for the builder types it can be fun also. I give a 'good' rating as Impressions could have made it just a little more entincing for the average gamer.